UNCASVILLE, Conn. – June 2016 – Barrett-Jackson, The World’s Greatest Collector Car Auctions®, announced today that the extremely rare 2004 Ford GT Prototype CP-1, VIN #004, will cross the block during the inaugural Northeast Auction June 23-25, 2016, at Mohegan Sun. CP-1 (Lot#654) is the first fully functional Ford GT prototype built in 2003 as part of the development phase. It is offered with factory Build Sheet documentation, and remains fitted with test connections and monitoring equipment used in road and Emissions Certification testing. 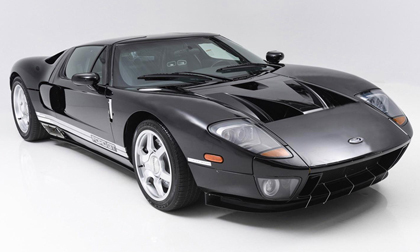 Lot #654 is the first Ford GT prototype built in 2003 to be fitted with a full drive train and interior. The three preceding prototypes were non-runners built for exhibition only and currently reside in the Ford Museum. CP-1’s body and engine compartment feature an array of non-standard components and many design features that are exclusive to this prototype, such as the airbags, which are Mustang components, and the steering column from a Ford Windstar. As a prototype, CP-1 includes several components that did not make it to production, including silver trim rings on the seats and the Camillo Pardo-designed all-aluminum headliner, which was replaced with a more traditional sound-padded roof. It also features a set of experimental exhaust pipes connected by a “sniffer pipe” to determine accurate emissions output during the test phase. CP-1 is autographed by 13 members of the original GT design team, including Carroll Shelby, Bill Ford, GT Chief Designer Camillo Pardo and GT Chief Design Engineer Fred Goodnow. In 2008, a respected GT collector and author of the definitive book on the reborn Ford GT purchased CP-1 from Ford. While CP-1 has a fully functional powertrain and the car has a 17-digit VIN, prior to the sale in 2008 Ford engineers installed a chip in the engine to limit top speed to 5 mph. The new owner will also be required to sign an equipment sale acknowledgment with Ford Motor Company.